Vinayaka Chaturthi or Ganesha Chaturthi marks a big occasion on the Hindu calendar-the birthday of the adorable elephant headed god Ganesha. The festival is observed in the month of Bhaadrapada, starting on the shukla chaturthi (fourth day of the waxing moon). The date usually falls between 19 August and 20 September. The festival lasts for 10 or 12 days, ending on Ananta Chaturdashi. 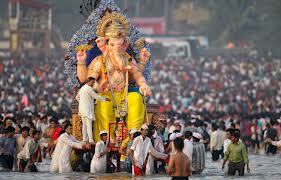 All across India and indeed around the world Hindus celebrate this occasion with great pomp and piety. However the biggest and the grandest party takes place in Maharashtra where the preparations for the day begin months in advance. 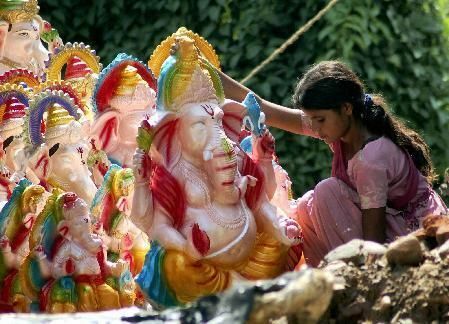 Thousands of skilled artisans spend months sculpting elaborate and beautiful clay idols of the god which people then buy to bring home or place them is specially erected tents (pandas) in the streets and squares. 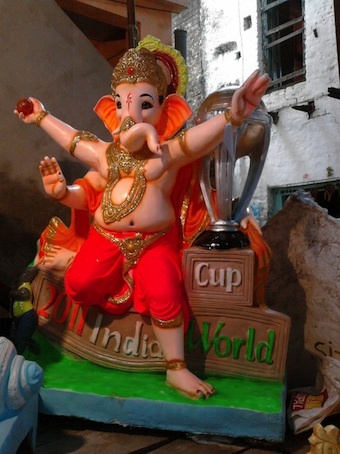 These idols which could be anything from a few inches to nearly 100 feet tall and are a joy to behold. 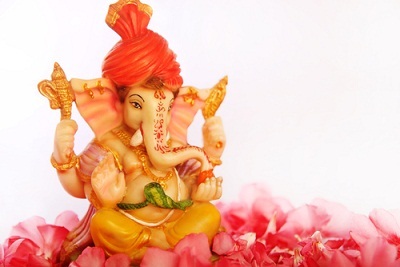 Often interpreted in the artist’s own vision, Ganesha takes on various avatars from the traditional to the contemporary and each one is unique. taking a taxi home or a van! 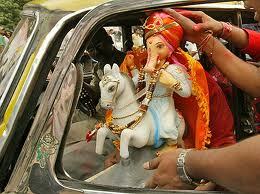 Once home, Ganesha is placed on a beautifully decorated altar and worshipped with love and devotion. Every morning and evening a pooja is performed with incence and flowers and he is offered his favourite foods like the sweet modak. Friends and neighbours come calling to see him and pay their respects. 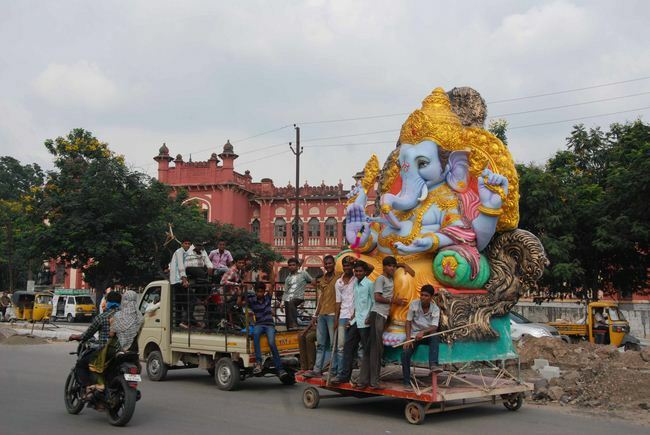 On the streets, people go around town with their families from pandal to pandal checking out the colourful lights and decorations and of course the various Ganeshas. It is a time of coming together and rejoicing in the company of this Lord of the People. The god of wisdom and compassion, the remover of obstacles. During the independence struggle Lokmanya Tilak started the practice of communal celebrations of Ganesh Chaturthi to bring the masses together. To this day the legacy lives on. Although the celebrations seem commercialised like everything else in our times, it is still an occasion for festivities and joy. After ten days of festivities it is time to bid farewell. Ganesha is carried through the streets in a procession accompanied by dancing and singing, to be immersed in a river or the sea. A symbolic ritual see-off of the Lord as he sets back on his journey towards his abode on Mt Kailash while taking away with him all the misfortunes of man. 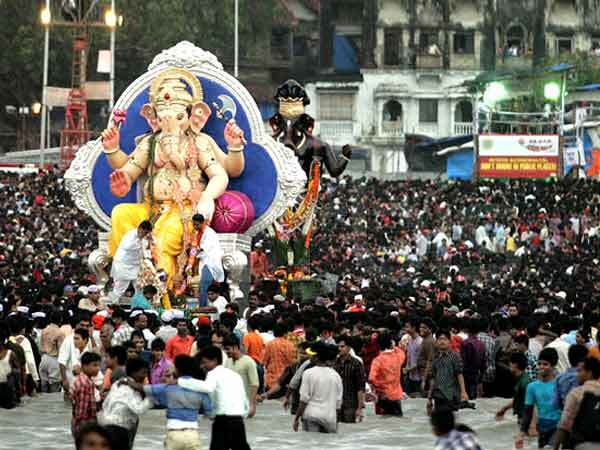 It is a sombre event and people return to their homes quietly looking forward to next year when Ganesha will be back again.